Currently there are three different ways to install the H2O package in R and depending on the build or version of H2O the user wants to install one method will be more applicable than the others. The instructions below will walk the user through download from CRAN, download from 0xdata website, and install from the most recent source code; all of which makes the assumption that the R session is running R 2.13.0 or later. Download one of the release from our website. The downloaded package will contain both the H2O jar file as well as the R tar package file for R installation. After download completes, unzip the file and navigate to the R subdirectory with the tar package. Start up R or Rstudio and install the R client package by running install.packages and inputting the location of the tar file. Finally load the library and check that a simple demo script runs. Navigate to one of releases available on our website. Select the INSTALL in R tab and follow the R code for installation. When downloading from CRAN keep in mind that the initial download from CRAN contain only the R package but when running h2o.init() for the first time R will automatically download the corresponding H2O jar file, before launching H2O. For developers who want to actually make changes to the R package before building and installing it, start with pulling the source code from Git and follow the instructions in From Source Code (Github). Once a build has been made, navigate to the target directory and subsequently to the Rcran folder with the R package and run an install. 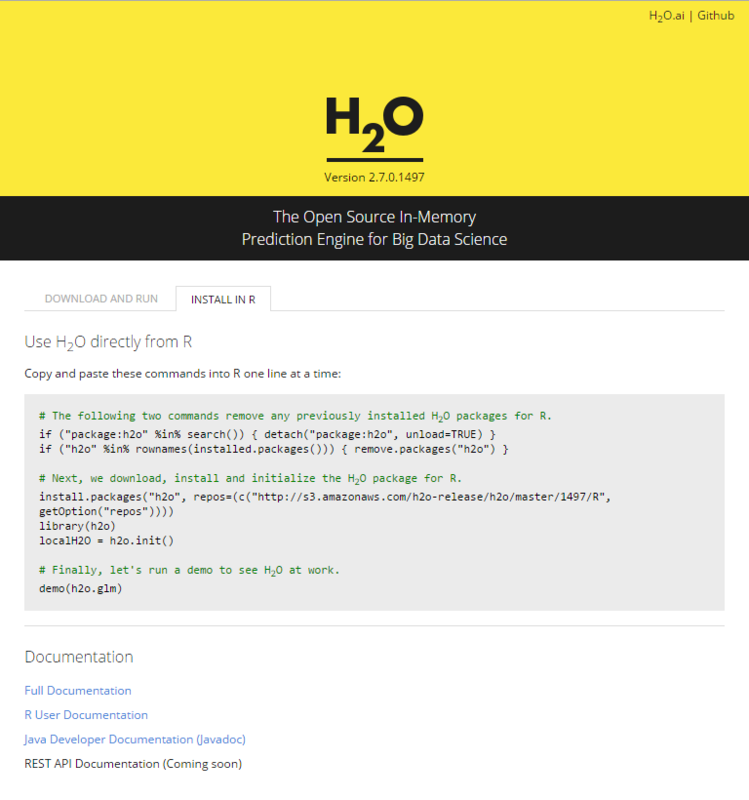 When upgrading H2O the user will need to upgrade their R package as well. In order to prevent a version mismatch, it is recommended that users manually upgrade their R packages. For instance, if you are running the bleeding edge developer build, it’s possible that the code has changed, but that the revision number has not, in which case manually upgrading ensures the most current version of not only the H2O code, but the corresponding R code as well.